Techsmith - Camtasia Studio, Snagit, Camtasia for mac, Camtasia Relay, Morae, Jing Pro Hong Kong/Asia Distributor, Reseller | Cogito Solutions Ltd.
with visuals that give your ideas clarity and help you explain any subject. See for yourself. 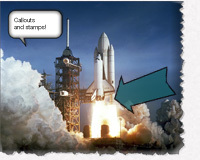 The more you use Snagit, the more ways you’ll find to use it. Show them what you do, and how you do it! Using MPEG-4 video format you can now create screen videos for demos or quick reviews, and share them instantly to YouTube, Facebook, and more! Snag anything, on the fly. Grab your entire desktop, a region, a window, or a scrolling window—all with a single hotkey or click. In addition to the basic capture profiles, use these time saving options to capture and share content in one click. Create custom graphics easily by taking multiple captures and putting them together. Draw attention to a specific part of your image. Just select the portion you want and Snagit will blur and darken everything else. Add effects to your image, even if you don’t have a design degree. Draw attention with arrows, hide sensitive information with a blur, add a text callout or torn edge effect… just to name a few. Here's a look at each step in more detail. With Camtasia Studio’s flexible recording options, you can choose to capture full screen, window or region. Add in music tracks, microphone, your computer's audio, plus picture-in-picture with your video camera, and you've got a world-class screencast. 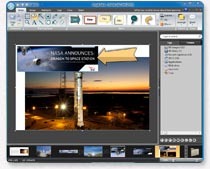 The toolbar inside of PowerPoint makes it one-click-easy to record your presentations, either live or from your desk. TechSmith's exclusive SmartFocus technology keeps track of where the action happens during your recording. Then it produces a video that zooms in on the parts you need to show. Once you have your content recorded, polish it up and turn it into a professional screencast. Add a graphic over your video to direct the attention of your viewers. You can even link to an external webpage or jump to a part of the video. Highlight cursor movements and mouse clicks to help viewers follow the action. The final step in creating a screencast is sharing it with your audience - and Camtasia Studio makes that a snap. With just one click, your video is on its way to YouTube or Screencast.com, TechSmith's video hosting service.